Our sheet music apps allow you to listen to your digital sheet music with playback, instantly transpose scores, markup and highlight sheet music files, organize your music with folders and set lists, and much more! 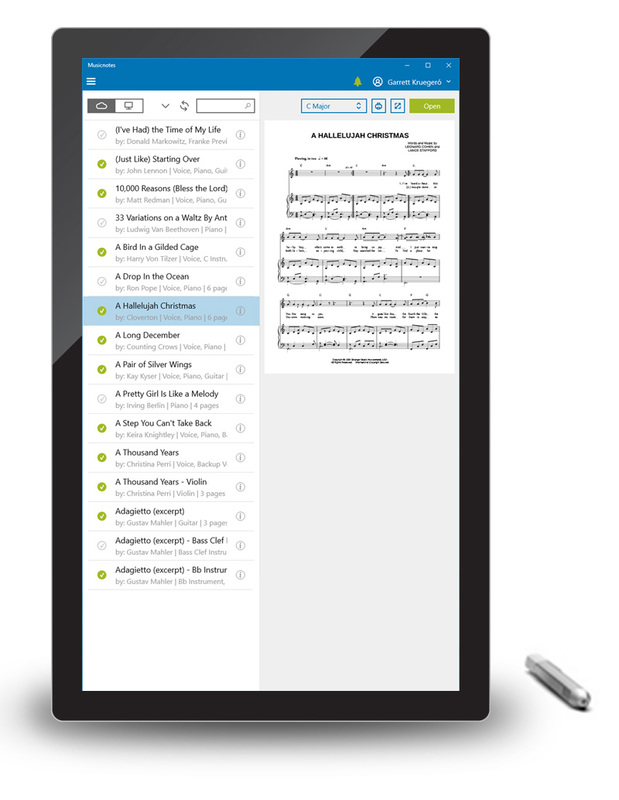 Our 100% free iPad, iPhone, Android and desktop apps offer instant access to all of your Musicnotes.com sheet music files, plus leading-edge tools and features created by musicians, for musicians. Say goodbye to hauling around stacks of paper, and experience the ultimate in sheet music accessibility. 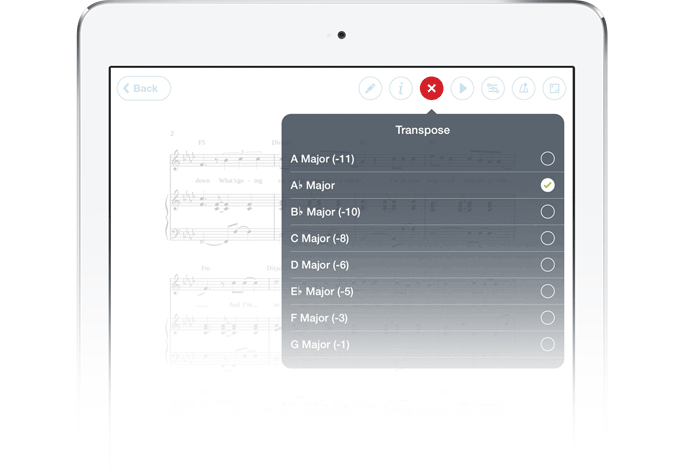 Listen to your sheet music and interact with it using tempo and audio mixer adjustment tools. * Not all pieces of sheet music are transposable. Make pen, highlighter, and text notes on your sheet music. Choose from a slew of colors, brush thicknesses, and fonts. 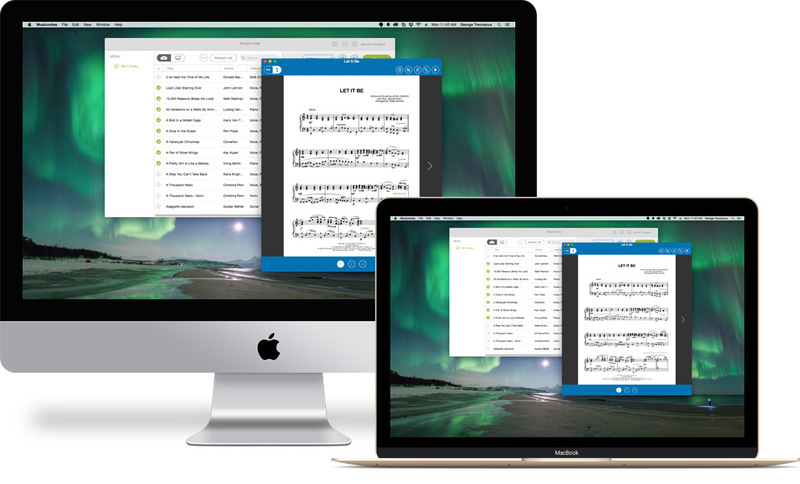 Use our Mac, iOS, and Windows apps to print your sheet music right from your desktop. Printing for Android is coming soon! 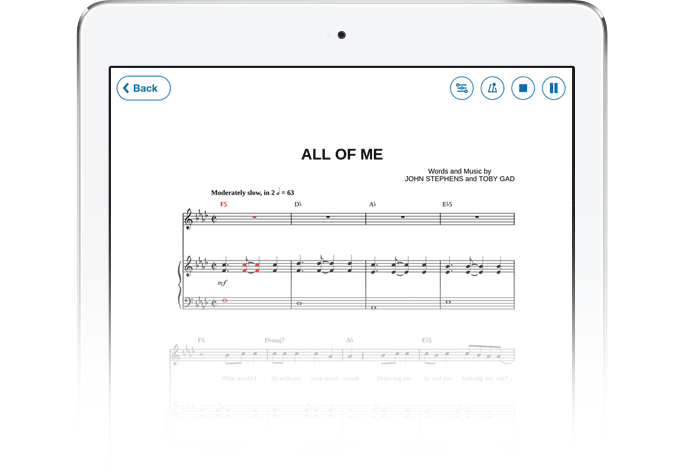 Our free Musicnotes Sheet Music Player turns your iPad into the ultimate sheet music machine. 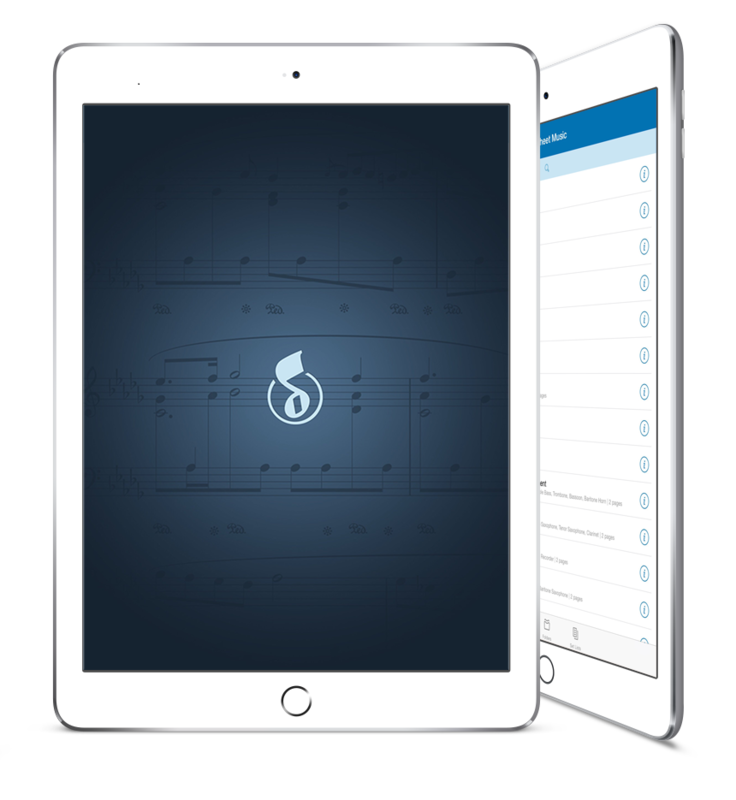 Our iPad app stores and organizes your entire digital sheet music library, including your own imported PDFs, so you're never without the score you need. Super easy-to-use functions, created specifically for iPad users, will help you practice and perform like a pro. Enjoy custom playback of your Musicnotes sheet music files with audio mixing, tempo control and selective muting. Use the selection tool to choose your playback start and stop points, and turn on optional looping to study a difficult passage. 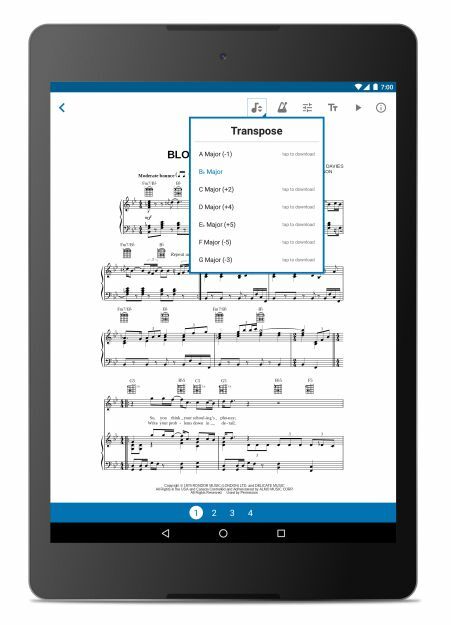 In-app transposition function allows you to select from available published keys to adjust the range of a piece on your iPad, then you can print your Musicnotes sheet music purchases with any connected AirPrint printer. Download the Musicnotes Sheet Music Player for iPad in the App Store today, and experience your sheet music in a whole new way. NEW Musicnotes Sync add-on allows you to sync all of your Set Lists and Folders between iOS devices and become a member of Musicnotes Pro. Enjoy 10% off every Musicnotes digital sheet music purchase as a member of Musicnotes Pro. Selection tool allows you to choose your playback start and stop points with optional looping. Sophisticated audio/visual metronome with a range from 30 to 300 bpm. Easily add sheet music PDFs to your library from Dropbox or from your computer via iTunes. 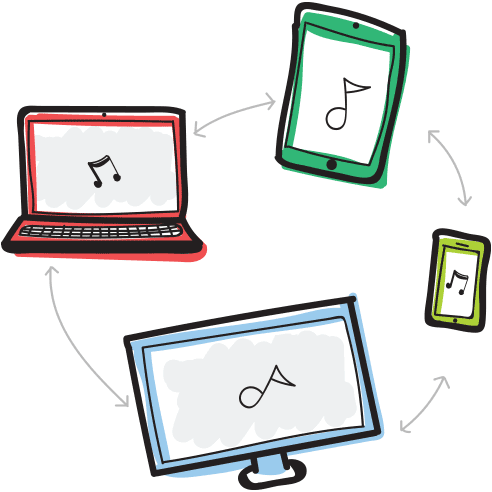 Print your Musicnotes sheet music purchases via any connected AirPrint printer. Access your entire library of Musicnotes sheet music and guitar tab files. Use built-in pen, highlight and type tools to mark up your sheet music. Sync your entire Musicnotes sheet music and guitar tab library. Use playback to hear and see the notes light up with the music. Change the tempo of your playback as you listen. Selectively mute or adjust volume of separate instruments and parts. Choose your playback settings for chords and guitar tab. Enjoy these 7 songs, compliments of Musicnotes! 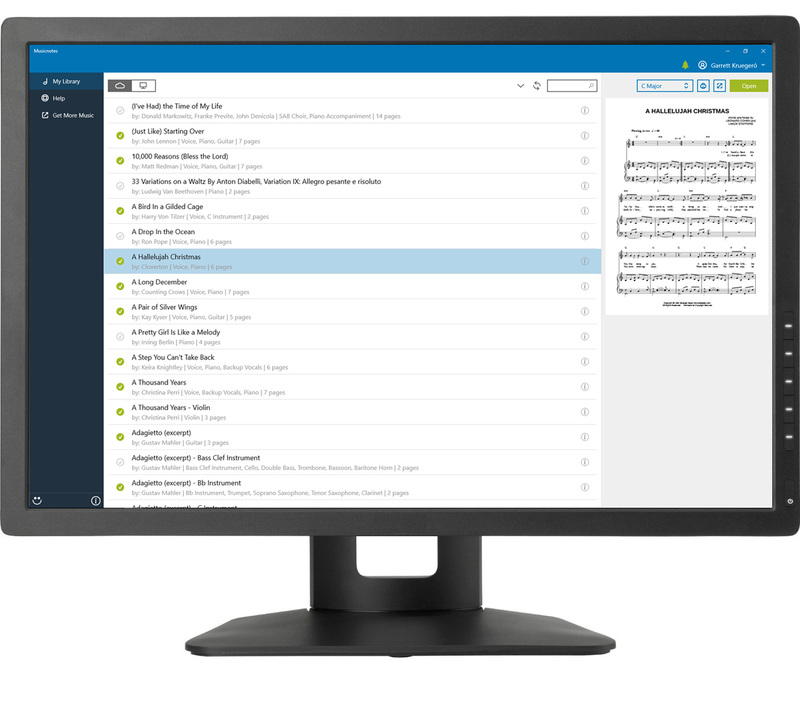 Experience better clarity with high resolution sheet music. Turn pages easily and jump to any page. Organize your music in folders and set lists. Supports the AirTurn and Pageflip hands-free page turners. NEW Print your Musicnotes sheet music purchases. 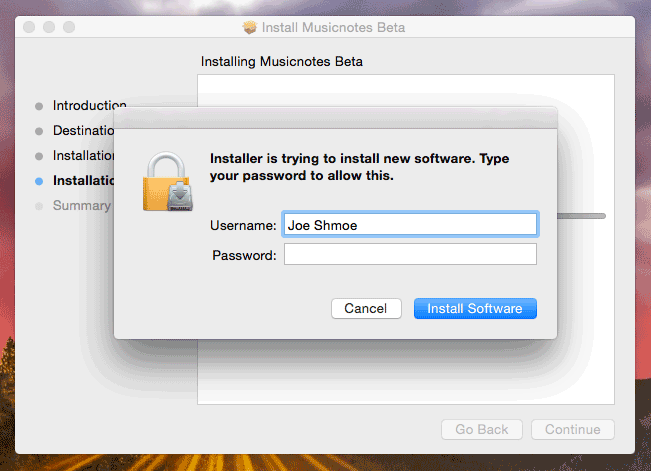 Use your existing Musicnotes account to access your purchases. Transpose and download your purchased music into available keys. Listen to your songs with visual feedback. AirTurn & PageFlip pedal support. Adjust the tempo in playback. Selectively mute or change instrument volume. Currently supported on OSX 10.10 (Yosemite) and 10.11 (El Capitan). 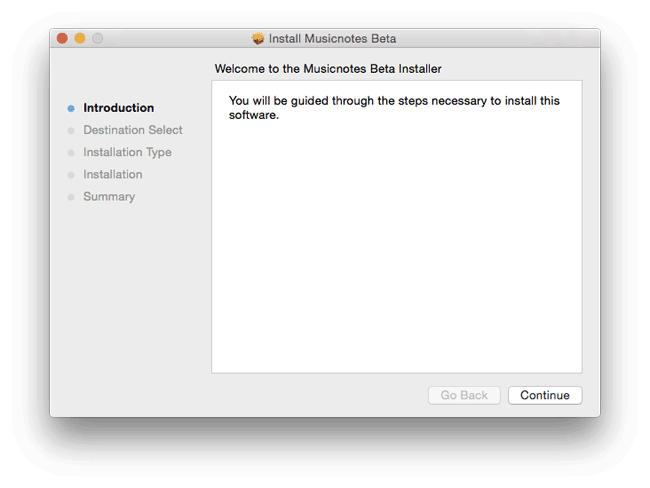 * Musicnotes Player for Mac can still be installed and used on OSX 10.9, but you may experience more bugs than usual. Select the "Download Now" button above and navigate to your default download location. 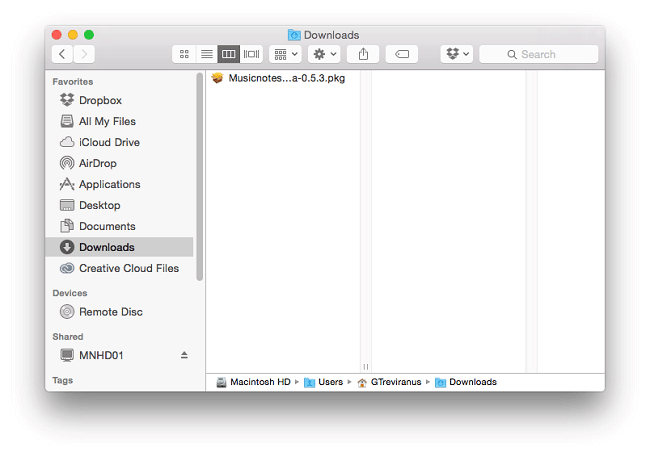 Open the folder (through Finder or your browser) to find the file, then double-click it to begin installation. Note: You may need special permission to install this package. If that's the case, CTRL(control)-click the package and select "Open" from the menu. You'll receive a prompt asking you to confirm. Select "Open" again to continue. An install window will appear. Select "Continue" at the bottom right of this window to get started. Select your desired storage device (primary storage will be selected by default). 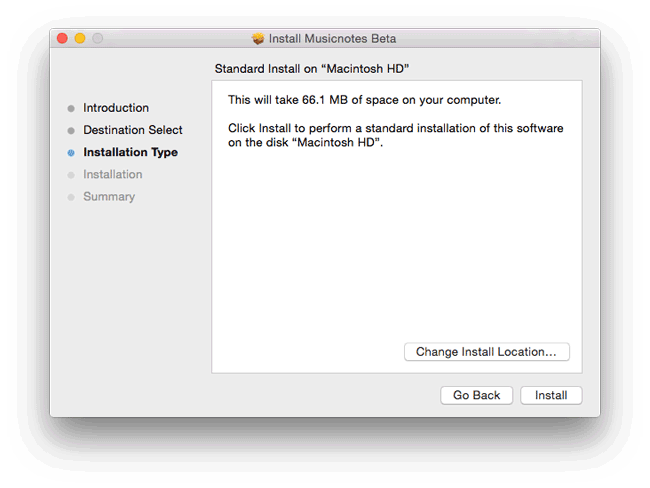 Although you have the option to select a different install location, we recommend not changing it. Select "install" to begin. If your user account on OSX has a password, you'll be prompted to enter it here. 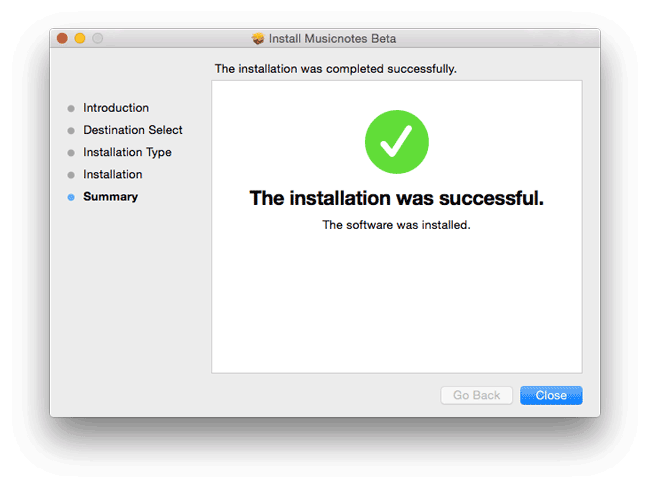 The install should only take a few seconds. And that's it! All that's left is to navigate to your Applications folder and look for "Musicnotes" to open and begin playing/listening to your sheet music. Questions or concerns? Contact our Customer Support team. Listen to, manage and play your entire Musicnotes sheet music library anywhere with the free Musicnotes Sheet Music Player for Android. 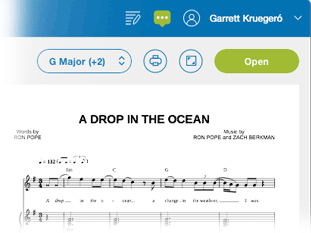 Newly redesigned with an easy-to-navigate menu, the Musicnotes Sheet Music Player allows you to hear and watch the notation light up on your digital sheet music and guitar tab files. Musicians and vocalists will appreciate custom playback options, including tempo control, key transposition and audio mixing, to fit individual practice and performance needs. NEW Selective muting and volume controls allow you to playback only the parts or instruments you need to hear. Options for different paper types. × Looking for our player for Windows 8 and below? 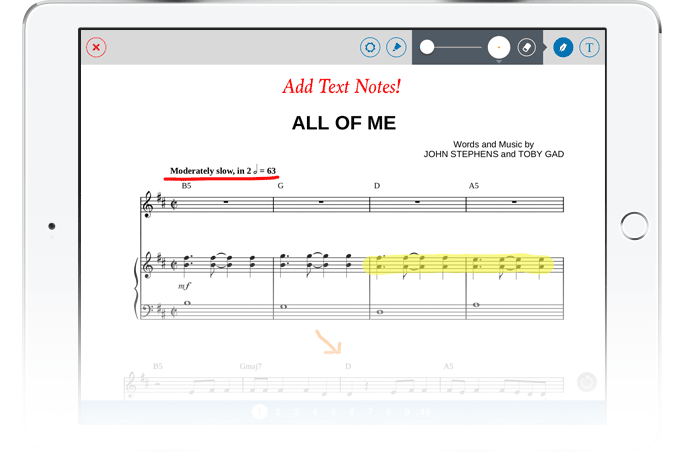 NEW Use built-in pen, highlight and type tools to mark up your sheet music. 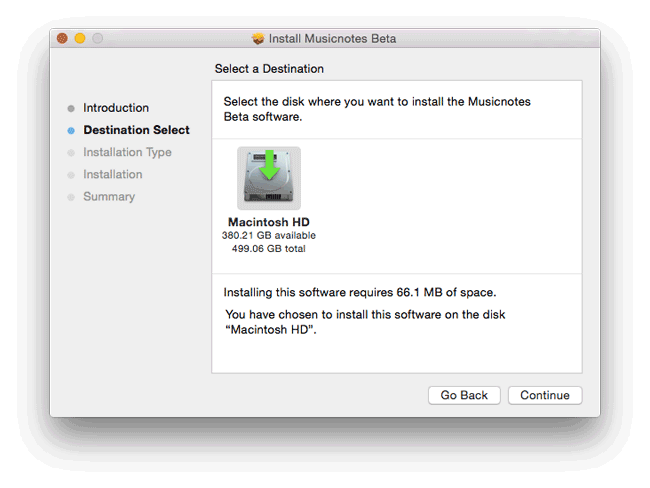 Print your Musicnotes sheet music purchases. While we strive to maintain consistency between apps, some features may not be fully available across platforms. Rest assured we're working hard to deliver your favorite features to your preferred device/operating system! Contact us if you have any further questions or need help.